This article is about the place in Bridgend. For other places called Betws or Bettws see Bettws (disambiguation). Bettws /ˈbɛtuːs/, also spelled 'Betws', is a small ex-mining and farming village in the South Wales Valleys in the county borough of Bridgend, Wales. Bettws is also an electoral ward to the county council. Bryngarw Country Park is approximately one mile away, with a footpath leading there from the village. The village is around 3 miles away from Junction 36 on the M4 Motorway, and is located to the west of Llangeinor and to the north of Brynmenyn. Bettws is located in the southern part of Bridgend County Borough in South Wales. 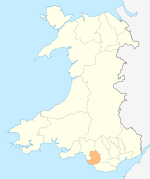 It is located 4.7 miles (7.6 km) north of the town of Bridgend and lies on the west side of the main A4064 road. It is situated on the River Ogmore, and is watered by the Llynfi and Garw rivulets which border the village on both its sides. The nearest parish to Bettws is Llangeinor to the north-east, and Llangynwyd to the west. The population of Bettws is around 2,400 according to The Betws LIFE Centre. At the national level Bettws is in the Welsh parliamentary constituency of Ogmore, for which Chris Elmore (Labour) has been MP since a by-election in 2016 which he won with a majority of 8,575. In the Welsh Assembly Bettws is in the constituency of Bridgend for which Carwyn Jones, the First Minister of Wales, has been the Assembly Member since 1999. For European elections Bettws is in the Wales constituency. At the county level, Bettws is an electoral ward to Bridgend County Borough Council, since 1995 electing one county councillor. Until June 2012 this was Labour councillor Christopher Michaelides who, shortly after finishing his year as county mayor and a month after winning the 2012 elections, died from cancer. In the 2011 census Bettws village had 910 dwellings, 884 households and a population of 2,253 (1,093 males and 1,157 females). The average age of residents was 36 years. Of those aged between 16 and 74, 48.4% had no academic qualifications or one GCSE. According to the census, 707 people were economically inactive of which 117 of those that stated they were economically active were unemployed. Christianity was the majority religion in the village being represented by 978 individuals, with 1061 recorded as having no religion and 195 whose religion was not stated. Almost all children aged 3–11 attend Betws Primary School. When pupils complete Key Stage Two, 91% of students attend Coleg Cymunedol Y Dderwen (formally Ynysawdre Comprehensive School and Ogmore School), with a minority attending Ysgol Gyfun Gymraeg Llangynwyd (they formally transferred to Ysgol Gyfun Llanhari) or Brynteg Comprehensive School. Many special need pupils go on to attend Ysgol Bryn Castell. Betws Eco Lodge is situated in the heart of the village. It caters for groups and individuals in a Bunkhouse style. The project is run by The Youth of Bettws, a local Charity for young people between the ages of 7 to 25 years old. Bryngarw Country Park lies to the south. ^ a b "Ward population 2011". Retrieved 10 April 2015. ^ "Bettws - Blaenau". British History Online. pp. 81–88. Retrieved 11 June 2016. ^ "Election Maps". Ordnance Survey. Retrieved 17 February 2016. ^ "Ogmore by-election - 05 May 2016". Election Polling. Retrieved 11 June 2016. ^ "Carwyn Jones AM". National Assembly of Wales. Retrieved 17 February 2016. ^ "MEPs by Region". European Parliament / Information Office in the United Kingdom. n.d. Archived from the original on 12 July 2013. Retrieved 25 May 2014. ^ "Bridgend County Borough Council Election Results 1995-2012" (PDF). The Elections Centre. Retrieved 12 April 2019. ^ "Tributes to Betws councillor Christopher Michaelides". Wales Online. 28 June 2012. Retrieved 12 April 2019.